This tall (50cm) plant has multicoloured pendulous flower clusters on long pink stems at any time of the year. They are a durable plant for the home - and loves growing in pots in any soil. It will quickly multiply and will go a faint olive gold if its given little water, these conditions will not kill it but more water equals a happier plant and a larger display of flowers in spring. 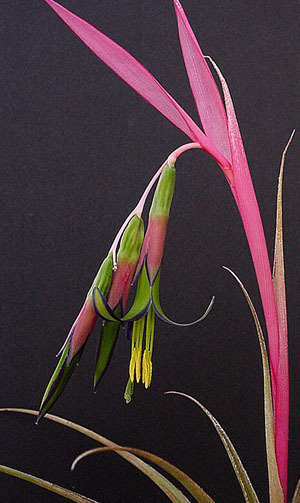 Billbergia nutans grows in partial shade to direct sun. If in a pot, the mix should be neutral to slightly acidic. The vase of the plant should be filled with water, the soil should be allowed to dry between waterings. Fertilize with a balanced fertilizer diluted to half the strength recommended on the label - the bromeliad will flower when it reaches maturity.